The XXIIIrd International Workshop on Helicobacter and related bacteria in chronic digestive inflammation and gastric cancer, organized by the European Helicobacter Study Group, took place in Rotterdam, The Netherlands, September 16-18, 2010. 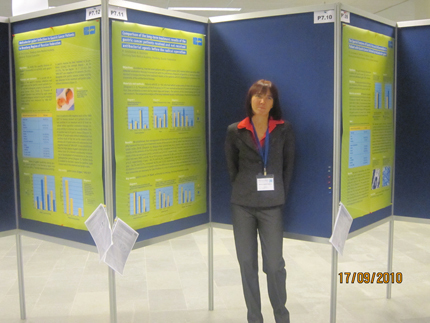 At the conference the scientific material, that won the main prize on «Helicobacter pylori infection in Russia» scientific competition under the patronage of AMA Co.Ltd, was presented by the author, Marina Sentchoukova, Orenburg, Russia. World scientists including the Nobel Laureate Barry Marshall appreciated very much the work of Russian researcher.